Happy Memorial Day! I’m thrilled for the extra day of this weekend. It’s been a busy few weeks. 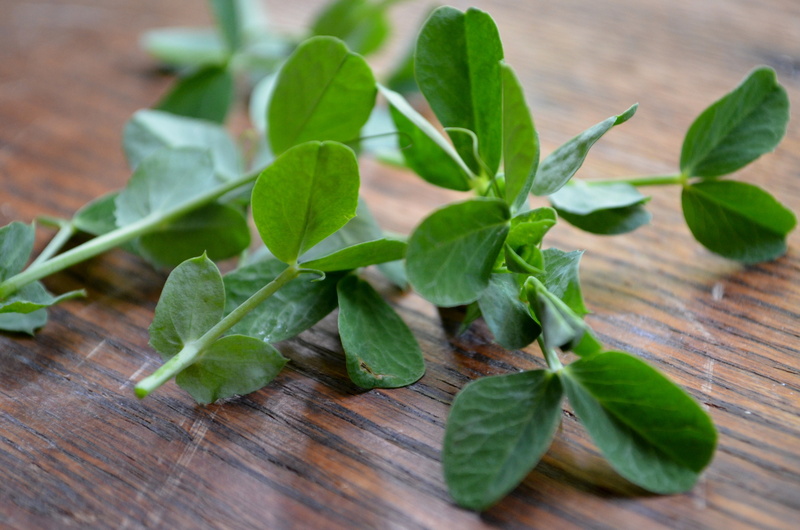 Today I want to share a great recipe I found in Cooking Light’s May issue for another use of pea shoots, which I featured last week in my pea shoot and beet salad. 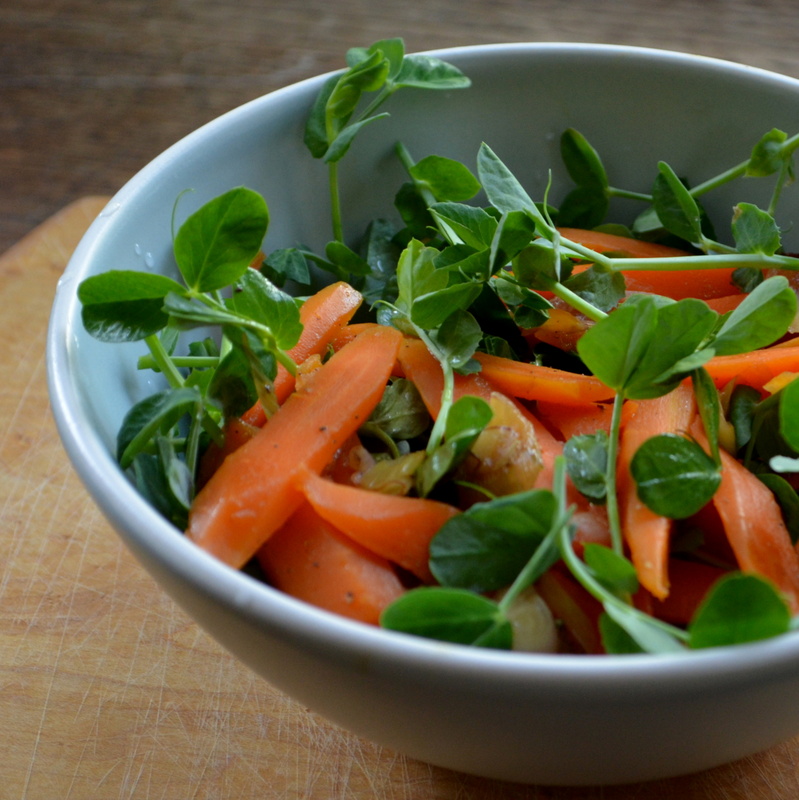 The recipe I am sharing today is a carrot and pea shoot salad with spring onions and is the epitome of spring. But first, I want to tell you about a few of the BIG changes going on and some of the things we saw on the trip we just returned from. One of the first BIG changes is that I will be going from working remotely in my home office to working at (gulp) an office five days a week. I will be leaving my job as a research manager at a market research company and joining forces with Meijer’s Consumer Insights team. I’ll be working on internal research to help improve the retailer and it’s brands. Very exciting stuff. My life will be much more structured but at the end of the day I’ll have more time each week because I’ll be going from a 50-60 hour workweek to a 40 hour workweek. Another BIG thing is that Cooking Light added my profile to their Bloggers’ Connection site and I’m thrilled! Check it out here. You’ll notice that I’ve added the Cooking Light Bloggers’ Connection badge to my page and I’ll just be sharing with you all a couple of the things I read about in Cooking Light each month. I have subscribed to Cooking Light for years and have shared their recipes with friends and family during those years. Now I’ll be sharing some of them with you! Now onto this trip. 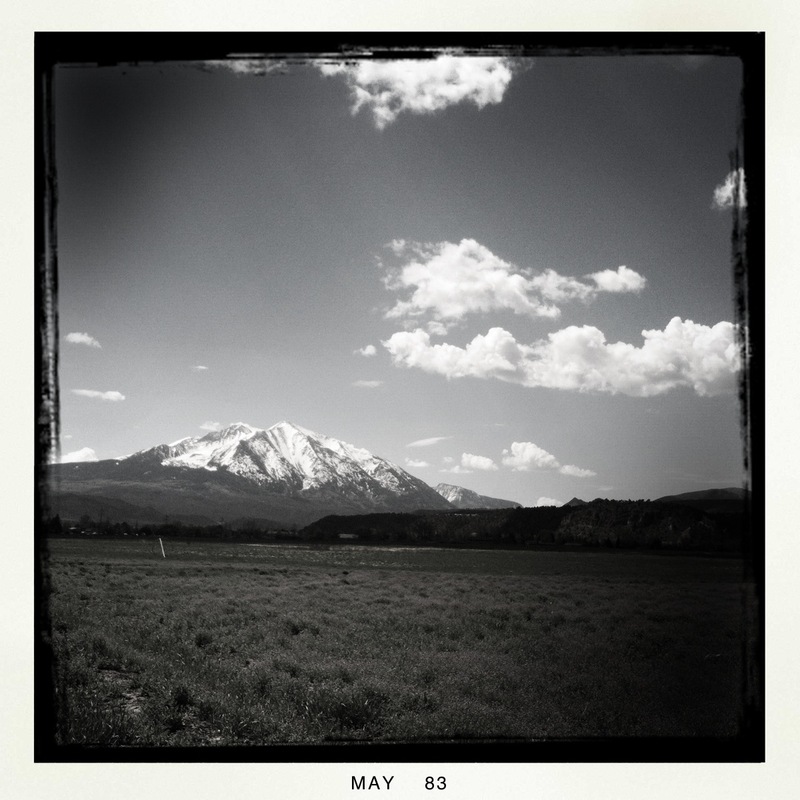 We went on a tour of America’s Heartlands and into Colorado for two weeks. It was an amazing trip. Though I have flown into several of the towns we visited, I have never driven to them. It was a wonderful experience to drive and see a sliver of Indiana, then lots of Iowa, Kansas, Nebraska, and Denver. 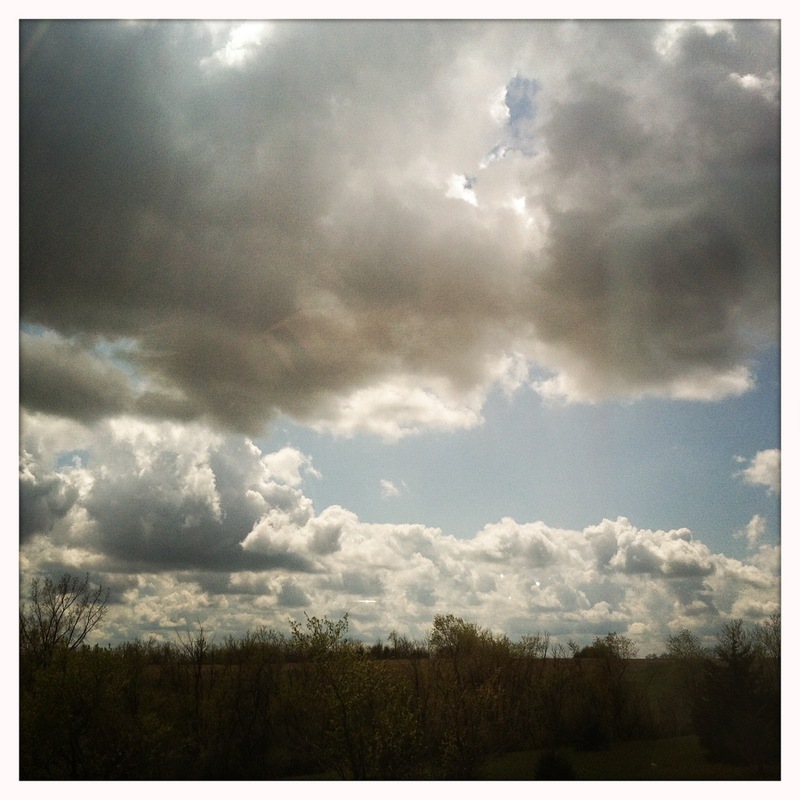 Iowa was surprisingly beautiful, with rolling green hills spotted with black cows and windmills. Did you know that Iowa gets 20% of all the energy in the state from wind? They have committed to generating 40% of their energy from wind, a goal that may be achieved as early as 2015. How cool is that? The first night, we stayed in a beautiful apartment full of antiques that is set up for traveling musicians. It was right behind the stage at the Legion Arts Center in Cedar Rapids. The Legion Arts Center is a wonderful building that showcases both artwork as well as some phenomenal musicians. It is right across from the Newbo Market, a mini-Pike’s Place of sorts that was opened just 6 months ago. In the morning, we had a great cup of coffee from the coffee shop on the first floor of the building and looked at art in our pajamas. The folks in Cedar Rapids were so wonderful–one couple even called ahead and bought our lunch at a funky diner called the Bluebird Diner in Iowa City on our drive to Topeka. It was an act of incredible hospitality and we are so grateful for it. Drew had Huevos Epsteinos and I think it went down as one of his top ten meals…at least that’s what I gathered when he ate them with his eyes closed most of the time. One of the few souvenirs we brought home was a bag of the Bluebird Coffee, which I think is worth special-ordering. In Topeka, we hit up the Topeka Zoo, where I fed a baby giraffe! 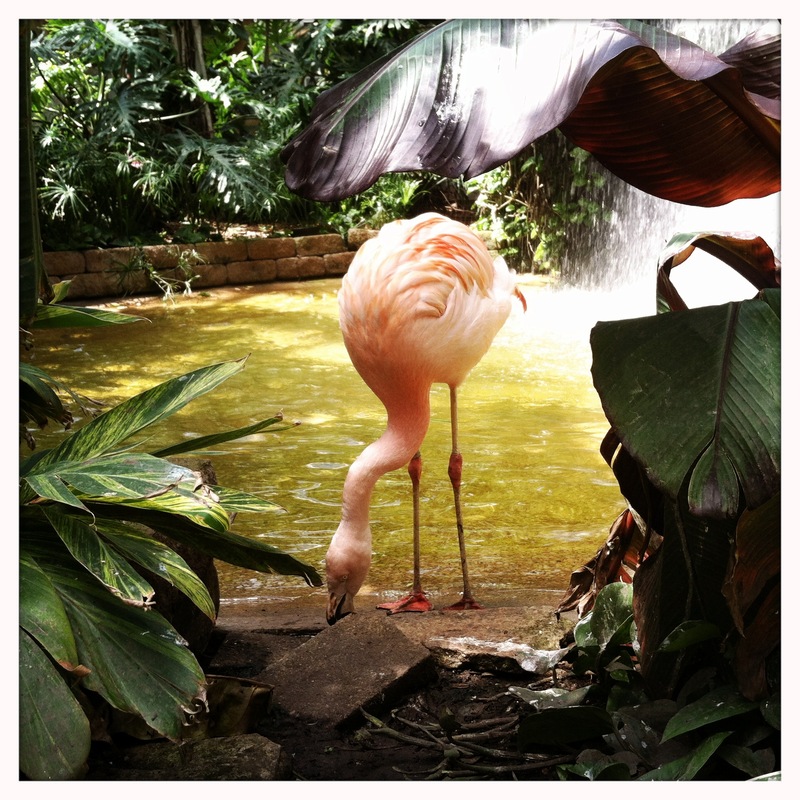 We also saw gorillas, tigers, lions, black bears, eagles, and this photogenic flamingo. We also saw the Westboro Baptist Church compound (from the outside, of course). There was a bright side to it–across the street from the compound, the organization Planting Peace purchased a house and painted every piece of siding a different color of the rainbow. A member of the Westboro church was on a ladder looking over the fence and praying against the house but that didn’t take away from the delightful presence of this house that promotes peace, fights bullying, and helps with orphanages, de-worming, and rain forest conservation. It’s wonderful to see this organization stand up for peace and this bold act gave me hope. 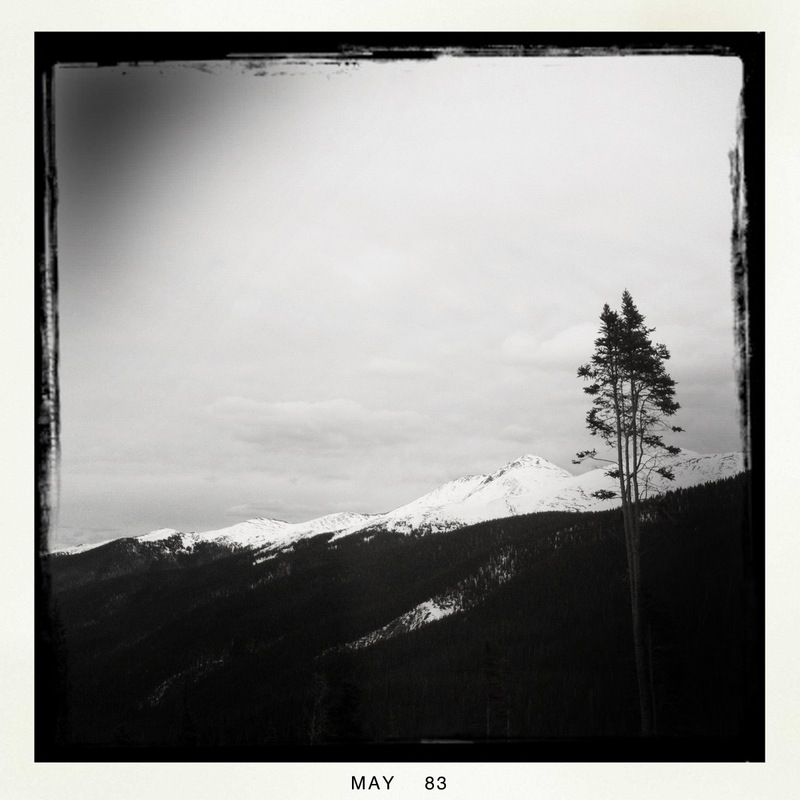 And then…the Rockies. Oh my goodness…the Rockies. Even though it was cold and sometimes snowy, the breathtaking views made me forget about having to bundle up! That night, we ate at a wonderful new restaurant called Town. (with a period) and had a great experience sitting at the community table and getting to know a few folks. Their clams were excellent as well as the roasted carrots and cauliflower. 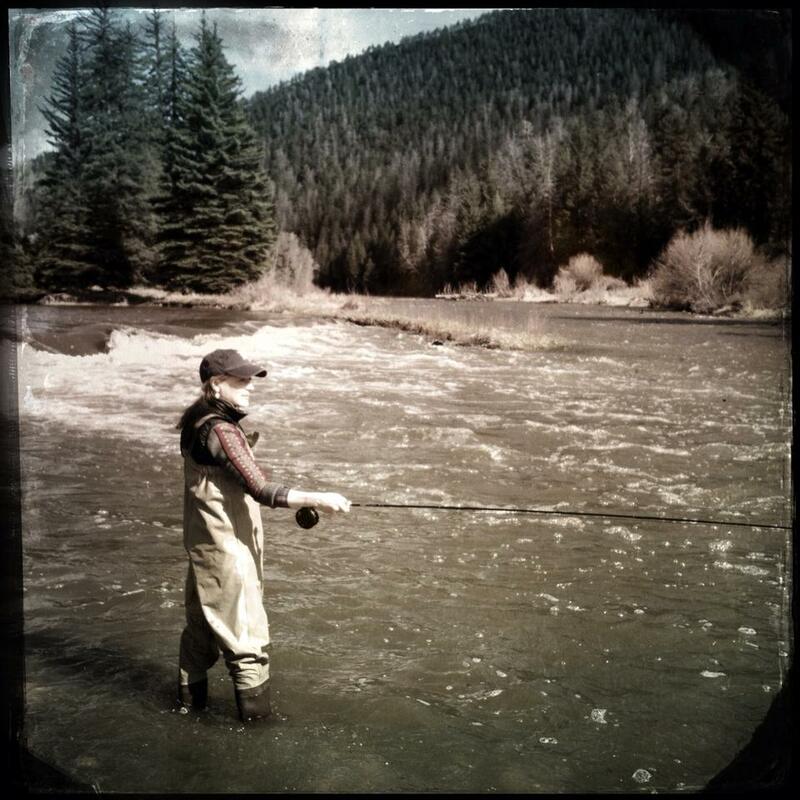 East of Carbondale, I had my first fly-fishing experience in the world-famous Frying Pan River. 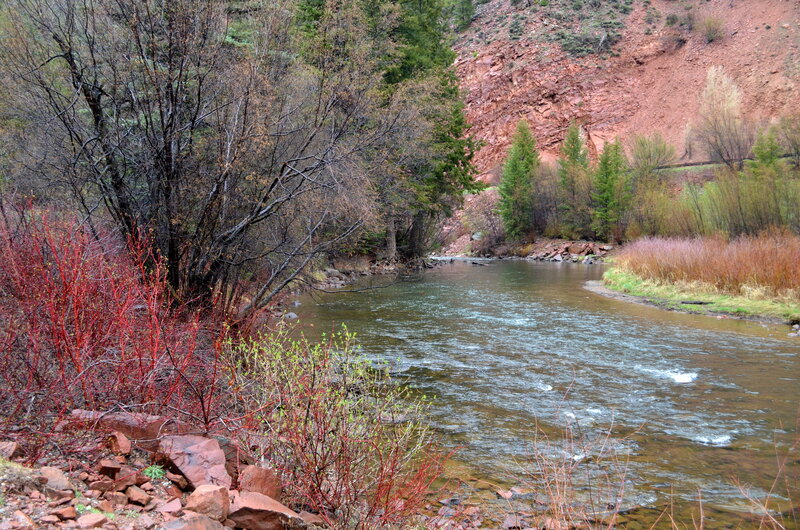 Standing in the water with the current pressing against my waders and looking at the incredible red rock cliffs that surrounded us, I started tearing up with the joy of being in such a beautiful place. My weepy moment passed quickly, though, because a rainbow trout came up to my leg and used my boot as a break from the current for about a half hour, joined by three of his pals for several minutes at a time. 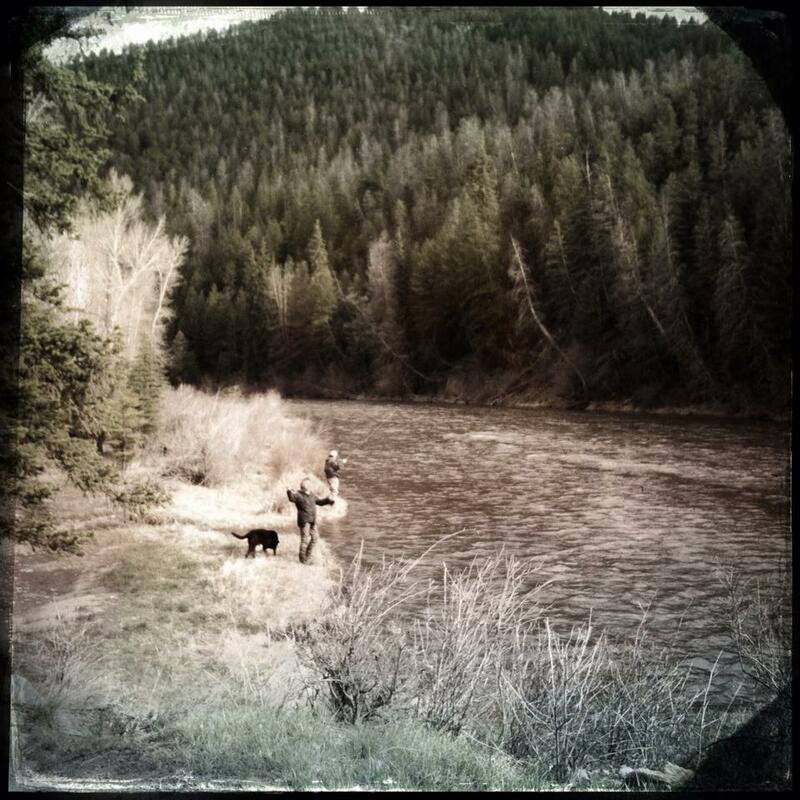 I learned how to cast, watch the strike indicator, and mend my line that day, all while staring down at my feet off and on to look at the pretty rainbows swimming by me. 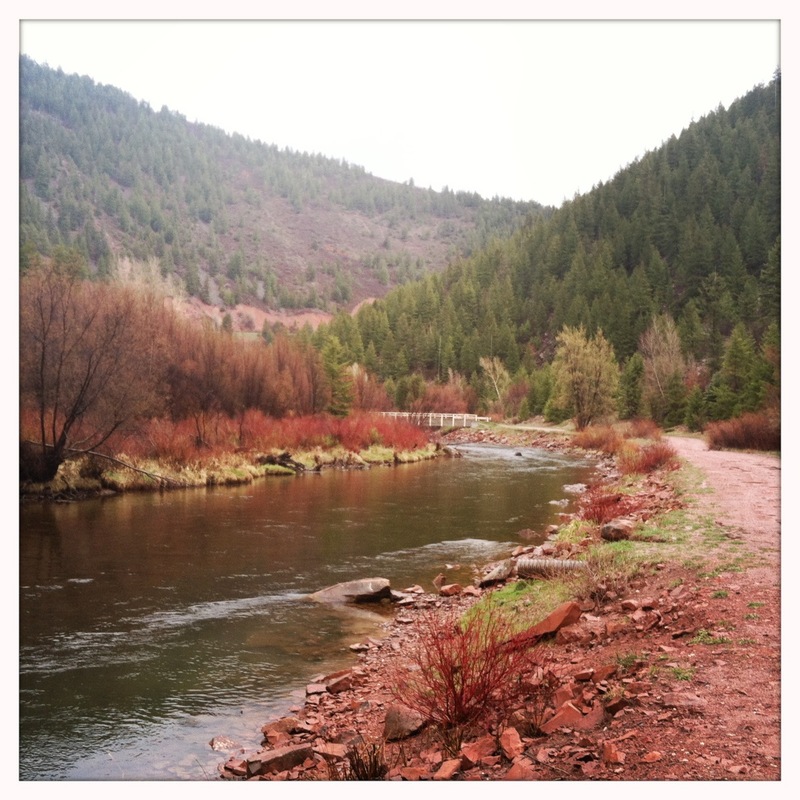 The drive from Carbondale to Westcliffe on Highway 24 was incredible. The terrain seemed to change every five minutes. 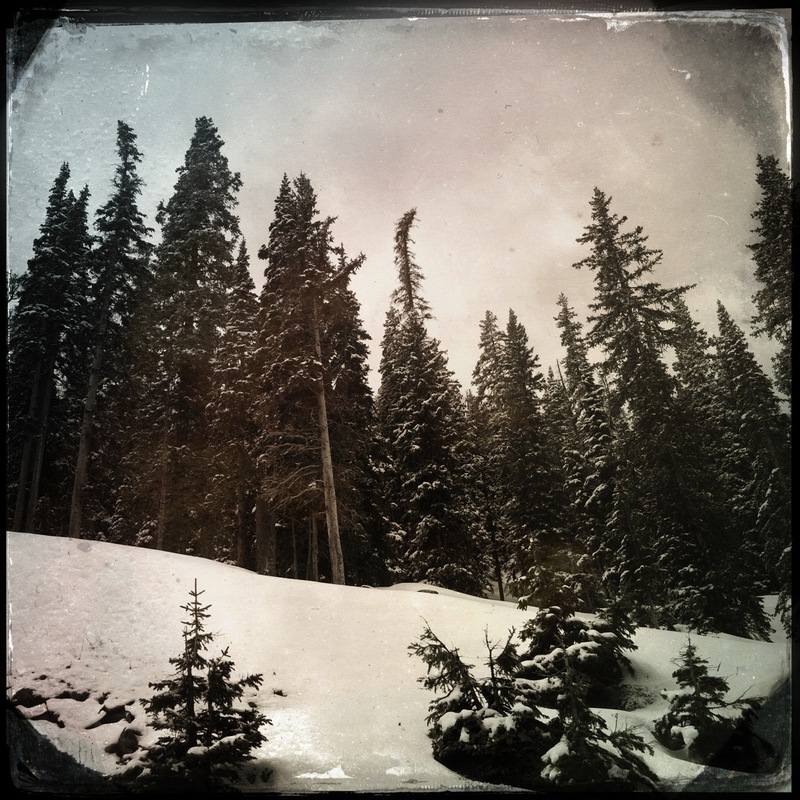 Rocky and desert-like at one turn, snow-covered pines the next. 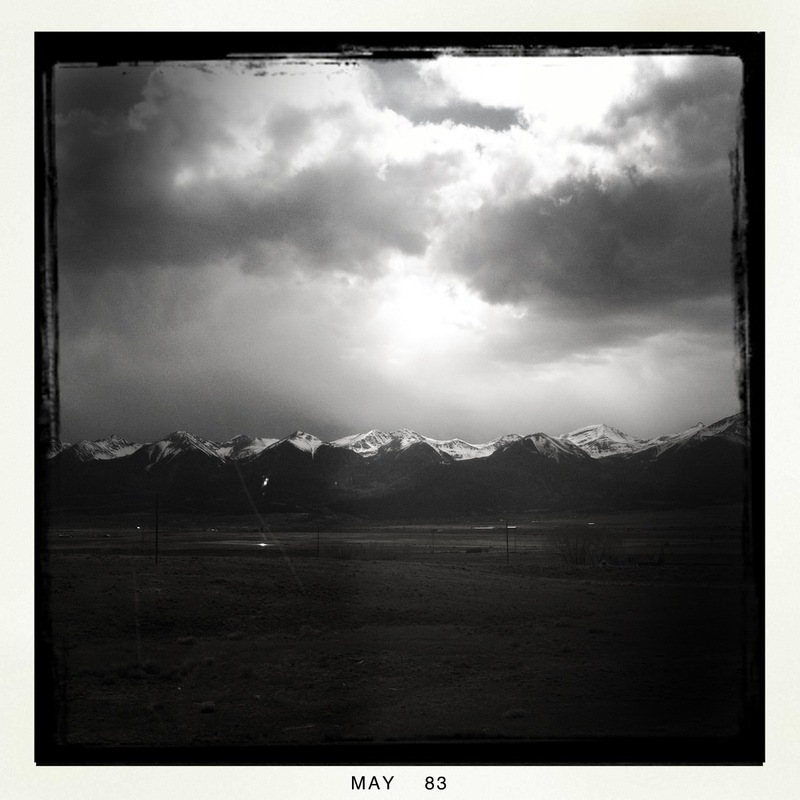 My favorite view on that drive was the Sangre de Cristo Mountains, a mountain range that is almost 250 miles long. Over the next weekend, we went fishing in the Colorado River where I got a great casting lesson from Shaggy, the awesome shaggy-bearded best friend of my sweetie. And then in the Blue River, Drew’s other buddy, Romano, taught me more about casting, mending the line, and setting the hook. And all of that coaching paid off! I caught my first trout by myself! The boys were so proud of me when they saw me mending my line, watching the strike indicator (bobber), setting the hook, and reeling the fish in. 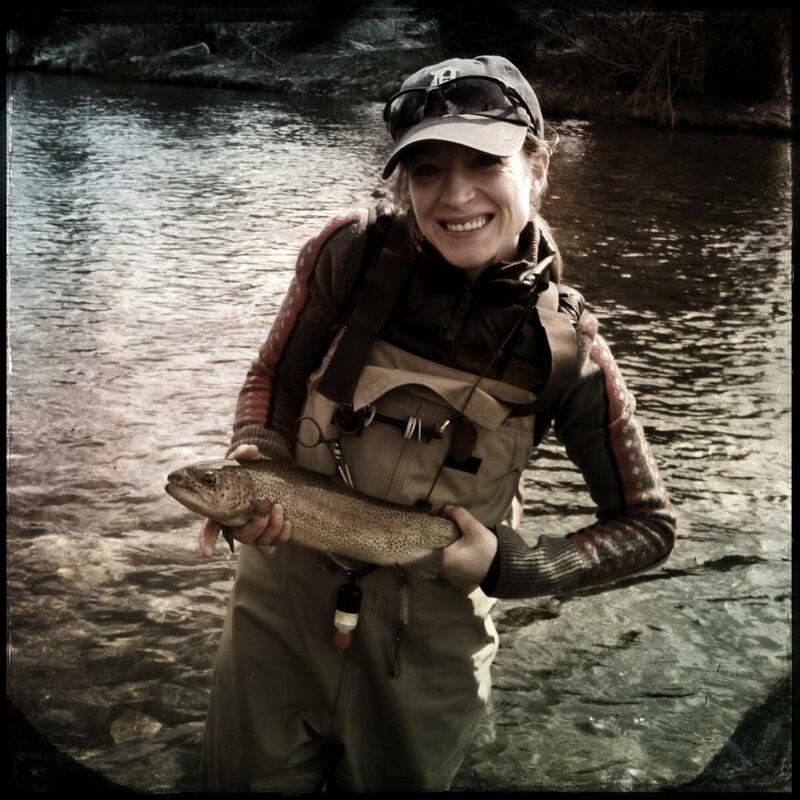 It’s catch and release out there, and that’s what we would do anyway, so no trout for dinner. 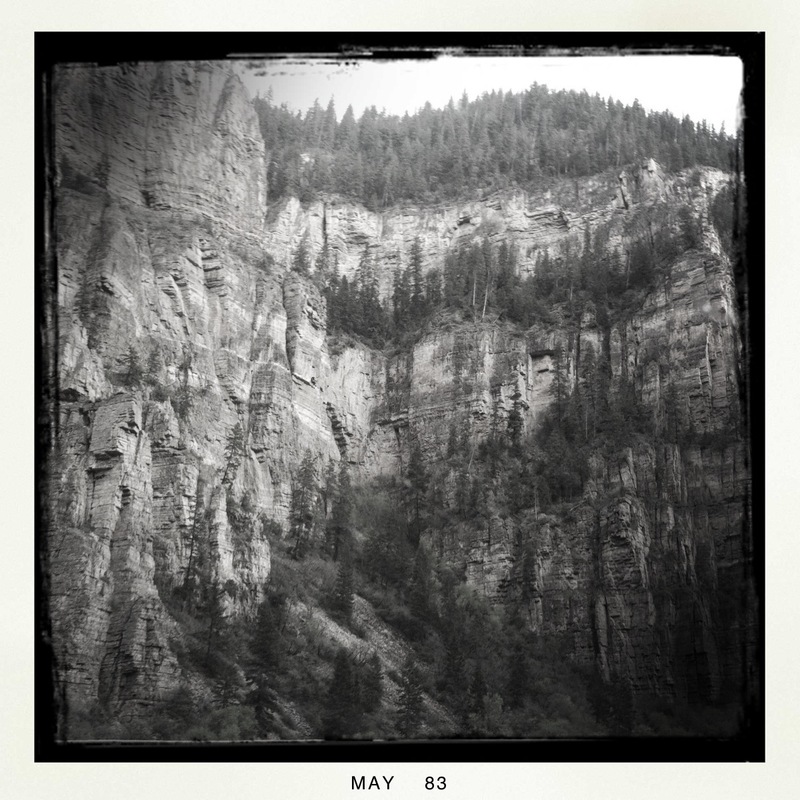 It was incredibly hard to leave the mountains behind to drive back to Michigan but we had much to do upon our return. After just a couple of days of being home my poor sweetie had a major surgery on Friday to correct a nerve-related motility disorder called Achalasia. The muscle between his stomach and esophagus was clenched so tight that most food could not make it through the tiny tube. It’s been such an irony that the boyfriend of a foodie/food blogger like me could not eat most foods for several months. But the surgery was so successful and slowly we are introducing foods back in. In a couple of weeks he will be able to eat everything I am eating, which will just be so wonderful. On Saturday, I ran home to let the pup out and decided to stop at the Farmer’s Market on the way home. 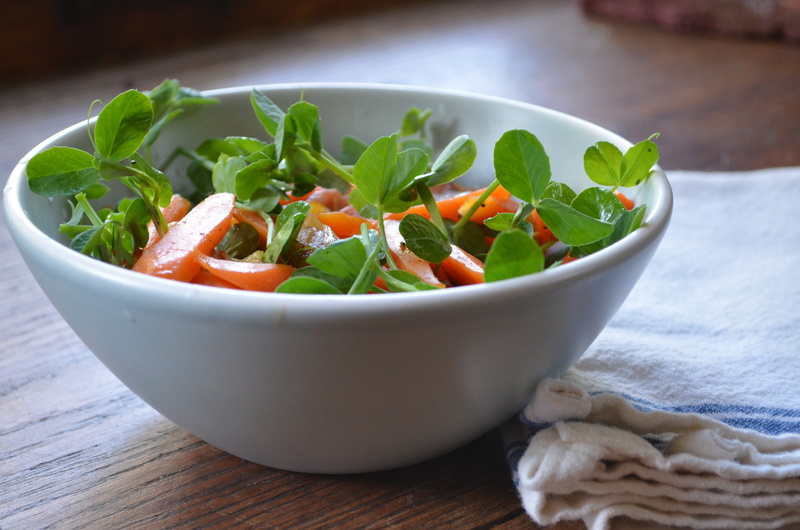 I was in the mood for more pea shoots, one of my favorite spring vegetables. I made a pea shoot and yellow beet salad a couple of weeks ago and loved it. On the trip, I thumbed through the May issue of Cooking Light Magazine and found another pea shoot recipe to add to the repertoire. This recipe was quick, just what I needed for my quick break, and delicious to boot. I had to use big carrots because there were no carrots ready at the farmer’s market so I just cut them on an angle for a nice presentation. The spring onions soaked up the sugar/vinegar glaze and were marvelous. 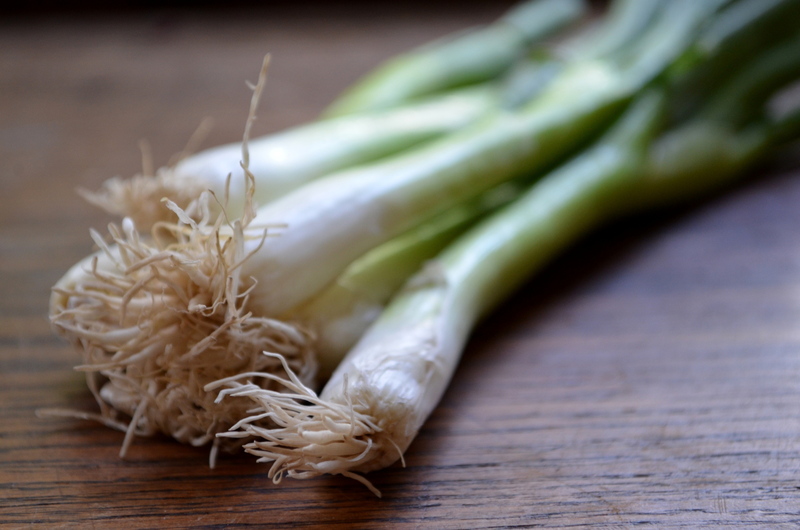 I may just cook up more spring onions with a little sugar, vinegar, salt, and pepper to mix into quinoa or spoon over crusty bread. Mmmmm! Stay tuned for more recipes from Cooking Light Magazine–I’m going to make a healthier version of biscuits soon once my honey can eat them. I’m picturing them with some fresh local butter and creamed honey……! But I am getting ahead of myself. 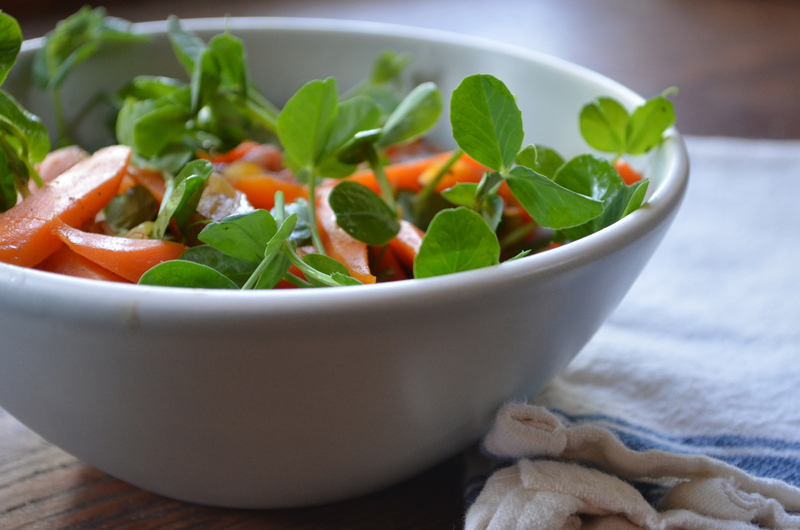 I hope you enjoy this great springy peas and carrots recipe as much as I did! Bring 6 cups water to a boil in a large saucepan. Add carrots; reduce heat, and simmer 5 minutes or until crisp-tender. Drain; rinse under cold water. 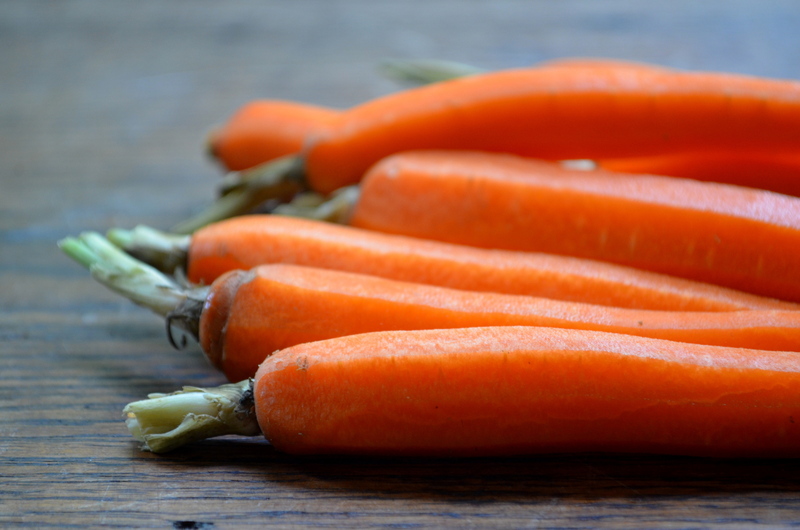 Rub carrot peels off with a clean, dry kitchen towel. Melt butter in a large skillet over medium-high heat; swirl to coat. Add onion; sauté 3 minutes or until slightly tender. Add carrots, sugar, vinegar, salt, and pepper; cook 2 minutes or until sugar dissolves and carrots are thoroughly heated. Stir in tarragon. Top with pea tendrils.